Question: Why did Sting Soccer Club apply for Players First licensing? Stuart Hilton, Technical Director of Sting Soccer Club: We ask our players to be reflective, accountable and apply a “growth mindset.” As a club/staff we operate the same way. The Players First licensing provided yet another means for reflection, accountability and growth. We align with the philosophical approach of US Club Soccer and the Players First initiative. We are committed to the long term development of our athletes on and off the field while recognizing and investing in the important influences, such as coaching staff and parents. 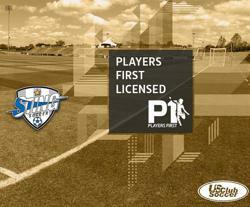 Question: What does it mean for Sting Soccer Club to now be an official Players First-licensed club? Hilton: We are very proud to have been selected as one of the first 46 clubs selected as a Players First licensed club. Our inclusion affirms that we continue to be on the right track in terms of building a culture of excellence in Club Development, Player Development, Parent Engagement & Education and Player Health & Safety. Hilton: The review process was a holistic look at Player Development. The comprehensive review of Club Development, Player Development, Parent Engagement & Education and Player Health & Safety means that Players First recognize the fundamental components of long term player development and overall health and well-being. We appreciated the rigorous nature of the application including (but not limited to) the requirement to provide evidence of certifications and of programming / content. Question: What would you like the parents of Sting Soccer Club to know about what this means to them? Hilton: Sting’s status as a Players First licensed club is yet another example of our commitment to our membership. We take our responsibility as a leader in youth soccer very seriously and strive daily to provide the best practices, programming, experiences and education for all involved. Also to note, that such standards hold true not only in the Dallas area as listed. Our programs currently extend into Austin-TX, San Antonio-TX, Corpus Christi-TX and Albuquerque-NM. The exact same care, attention and professionalism is applied across the entire club. This recognition highlights that. We hope that this further underlines our appreciation for our Sting family; go Sting!